I love coffee, but I only drink a cup or two a day. 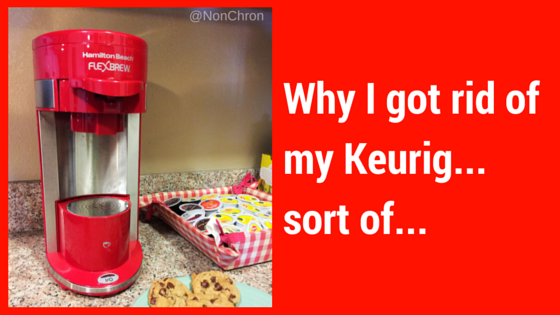 When the Keurig coffeemaker came out, it seemed like a great way for me to save money on not wasting coffee. I would always make a small pot of coffee and never drink it all. I tried to make a pot of exactly what I would drink, but it never tasted right. Regardless, I never actually bought a Keurig coffeemaker. I won one while at BlogHer a few years ago. To be honest, I loved it. The idea of coffee on demand is great. The thing is, after a while, I started wondering about the water sitting in the machine, especially since I would only use it on weekends. Sure, I cleaned it regularly, once every two months I would descale/clean it, but I slowly started to worry that maybe bacteria and mold was growing in there. Yes, I know bacteria and mold can grow in regular coffee pots. However, back when I had a traditional coffee pot, I would always leave the top open so it could dry out after I finished using it. Maybe it didn’t completely eliminate the problem, but it certainly helped. Finally, I decided to get a new coffee machine. The problem was that I still had a crap ton of K Cups in my cupboard and I didn’t want to throw them out. I found a little machine that seems to be the answer to my problems. I bought the Hamilton Beach 49962 Flex Brew Single-Serve Coffeemaker (affiliate link) from Amazon. It not only brews K Cups, but also regular coffee. It also doesn’t have a water reservoir. You just pour in water when you are ready to use it. Granted, there is likely still some water sitting in the machine after each use, but it can’t be as much as the Keurig which had a bunch of water sitting in it. The only problem was…how to get the water in there? After few tries, I figured out that if I use a 16 oz water bottle and fill it about half way, it will get the correct amount of water in there without much (or any) spillage. Sure, it takes a bit longer and you have to wait two minutes in between brews, but for my peace of mind, it’s worth it. I say I sort of got rid of the Keurig coffeemaker because I still use something similar. If you use your Keurig daily and clean it regularly, it’s likely fine. Since I didn’t fall into this category, I had some concerns and decided to make a change. I love my Keurig but I hear you on needing to be scrupulous about cleanliness and the fact that some people will make alternate choices. Sounds like we BOTH love coffee!! !